This effective liquid suppresses foaming and sudsing in spas, hot tubs, therapeutic pools, fountains, and pools. One of the most common difficulties expressed by hot tub and spa owners is the large amount of foam residing at the top of the water. This is a very common problem associated with hot tubs and spas, fortunately it can be easily fixed. In order to fully understand the solution to your problem, you need to first recognize the cause for the foam in the first place. Hot tub foam can be the result of many factors. 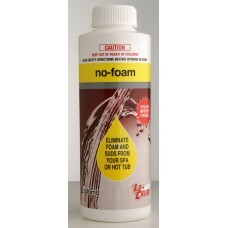 The most common cause of foam is the particles that are released from bathers when they first enter the spa. Dead skin cells, bacteria, residue from swimsuits and particles from tanning or body lotions are the most common reasons for the foam at the top of the water. These particles, combined with the particles released during chemical applications, can result in a high amount of total dissolved solids in the water. The higher the total dissolved solids in the water, the more foam you will acquire in your hot tub.